Home > Safety & Environmental Help and Guidance > Temperature & Humidity > What do we mean by Type K and Type T Thermocouples? A thermocouple consists of two different material conductors, which are usually forms of metal alloys. The connection point of these metal alloys creates a voltage in the vicinity of the point where the two conductors join. The voltage is dependent upon the temperature range of the different conducting metals; but not necessarily proportional. 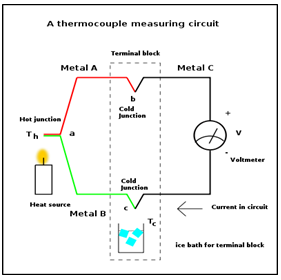 This is why thermocouples widely used as a type of temperature sensor used primarily for measurement, but also control because of their ability to convert temperature gradient into electricity, and also the fact that commercial thermocouples are inexpensive also. The most common types of thermocouples used are type K and also type T.
Type K consists of the two metal alloys Chromel (90% Nickel, 10% Chromium) and also Alumel (95% Nickel, 2% Manganese, 2% Aluminium and 1% Silicon). Due to the thermocouple having a Nickel base; this means that is has good corrosive resistance-meaning that it can be widely used in many applications and situations. It is the most common sensor calibration type which provides the widest operating temperature range. Type K covers the temperatures from −200°C to 1,260°C. It also proves to be most popular due to its good resistance against oxidization below 1000°C; and also the fact that it provides the 2 most inexpensive metal alloys. Type T consists of Copper, and the metal alloy Constantan(55% Copper, 45% Nickel). This thermocouple may be used in:- vacuum, oxidizing, reducing and inert atmospheres. Another popular property is that it is resistant to corrosion in most atmospheres. It also proves to have a high stability at sub-zero temperatures and its limits of error are guaranteed at cryogenic temperatures, this is the production and application of low-temperature phenomena such as sub -150°C. Its average temperature range is -185°C to +300°C; which means it proves to be the best thermocouple measuring low temperatures.